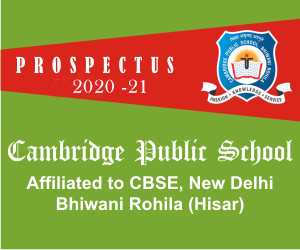 Dear Parents, It is an honour and an especially rare or fortunate opportunity to be the Principal of Cambridge Public School, the school that stands for excellence,perfection and continuously sets the highest standards in all the fields of education. The education means development of all the different faculties of man – physical, intellectual, moral and spiritual. 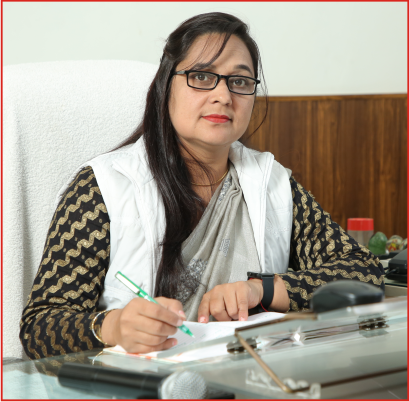 Character formation is one of the main aim of education. We know that in our country educational system has failed because character formation of the students has been neglected. True education helps us to understand and appreciate our environment and responsibilities to others, to the society as a whole, to the country and even to the world community. It also enables us to aware of our right and privileges as a citizens of the world. Since the students are future of a nation. They are the leaders, administrators and ruler of tomorrow. They are pillers of a nation. They have a vital role to play in every sphere of life. They should work for the promotion of basic human rights and mankind’s liberation form the shackles of poverty and inequality. It’s the duty of the teachers and society to channelize the unbridled energy of the students in the direct direction. The students can take their country on the top of the world by their concrete action. Effort and hardwork are the true ingredients of success. Success will come to you and fortune will embrace you if you work hard. C.P.S. creates a pleasant learning environment to home the skills to perfection. With best compliment.